Reference card and architecture reviews hit the internet a few days before Christmas, which armed us with the knowledge that the HD 7970 was capable of some heavy lifting. So heavy in fact, the HIS HD 7970, up for review today, comes with its own “Weight Lifter.” First, the strength of the recently crowned single GPU king will be put to test. Then, we will explore the possibilities once the shackles of CCC’s clock limitations are removed and a little extra voltage is added to the mix. With the improved 28 nm process and over 30% more stream processors than the 6970, I cannot wait to see what HIS HD 7970 is capable of when it is strapped into the test bench. 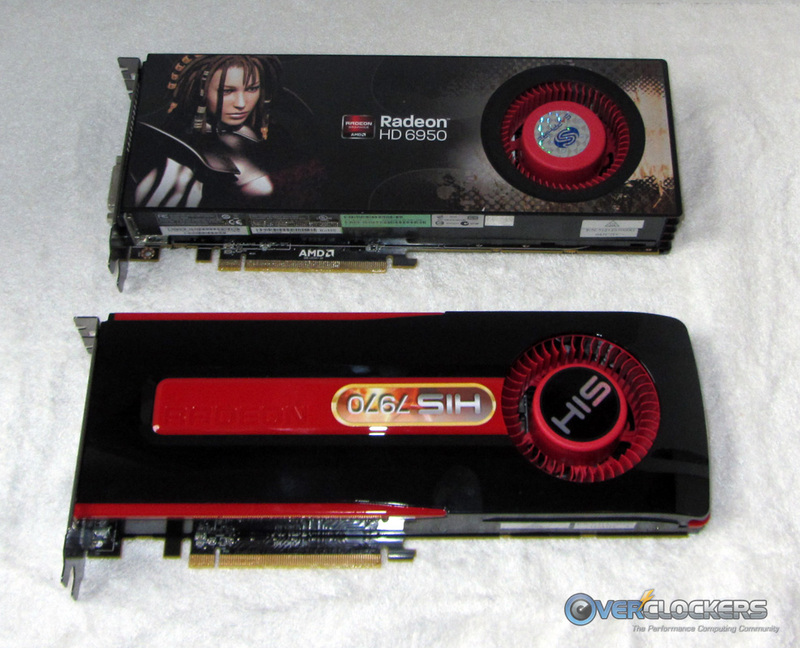 Again, being a reference card means the HIS HD 7970 is just about identical to the AMD version reviewed previously (aside from a few nifty HIS stickers and the box art). However, what review would be complete without gratuitous photos of the product. The box has a sort of “fairy tale” theme, with a large image of sword crushing a stone. 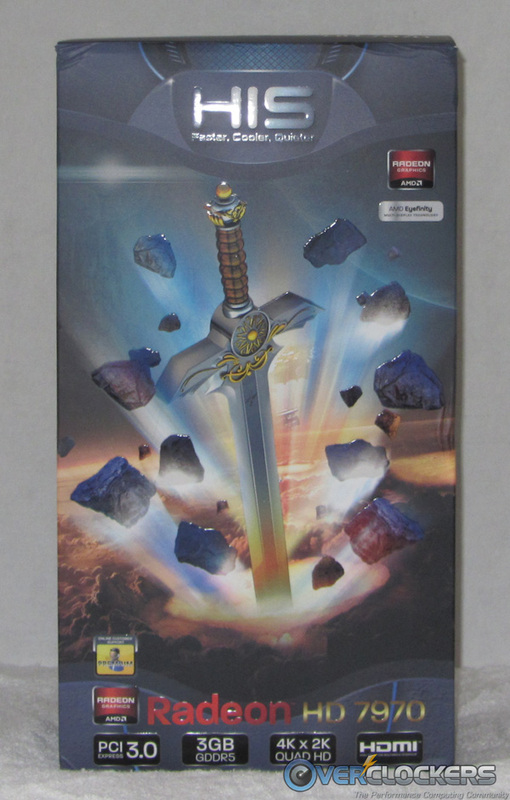 Excuse the lame pun, but hopefully this card crushes the competition as the box depicts. 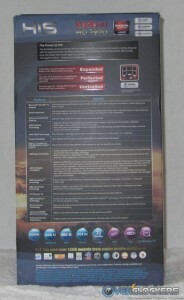 The packaging also lists the specifications and displays several HIS logos. Like a kid on Christmas morning, I could not wait to tear into the box and expose the hardware inside. The unveiling was slightly delayed as I discovered yet another box. The card was packed snugly in foam packaging making it nearly impossible for any damage to occur during transport. 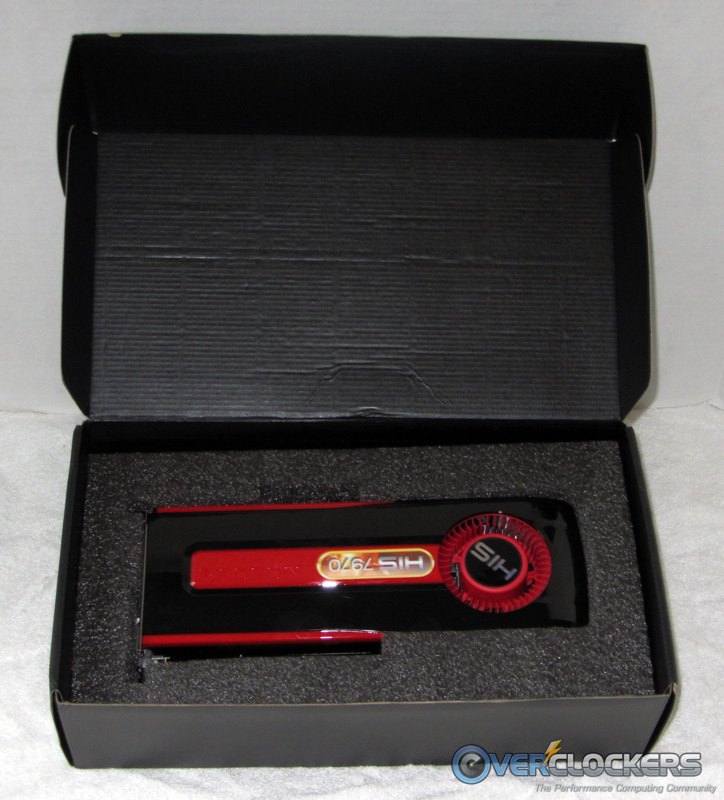 With a piece of hardware as expensive as the HD 7970, no amount of padding is too much to protect this investment! Underneath the card packaging was yet another box which contained all of the accessories. Included is a pretty standard battery of accessories with DVI-VGA, HDMI-DVI and mini-DP-DVI adapters, plus a CrossFireX bridge. 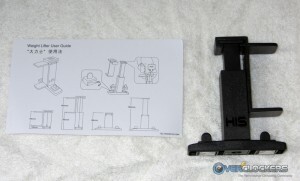 There was also a curious device called a “Weight Lifter,” which will be explained below. 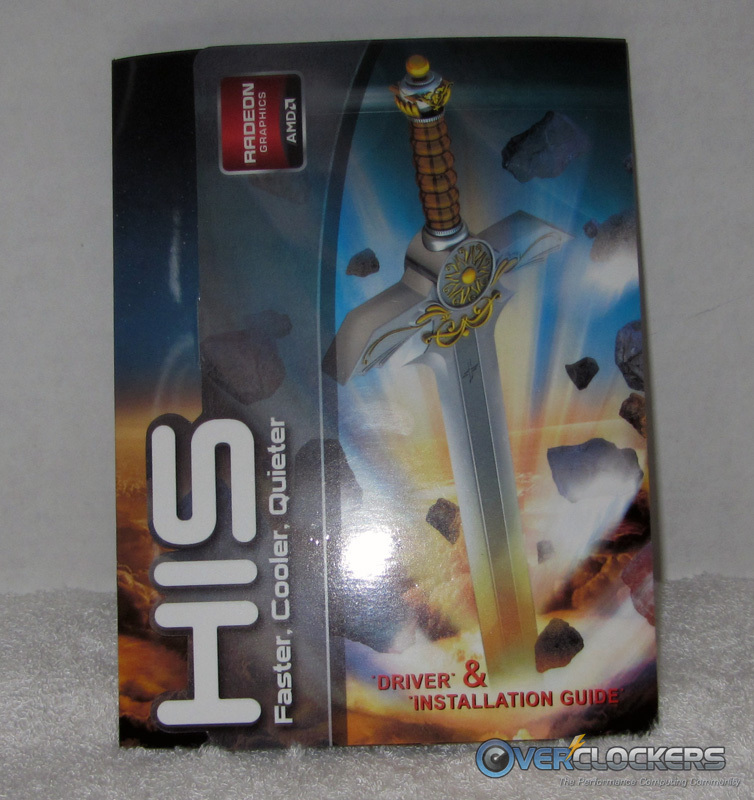 There’s not too much to say about the drivers and installation guide. Most of the readers here do not need a manual and will likely go to the their favorite driver database for the latest, most optimized version of the software. 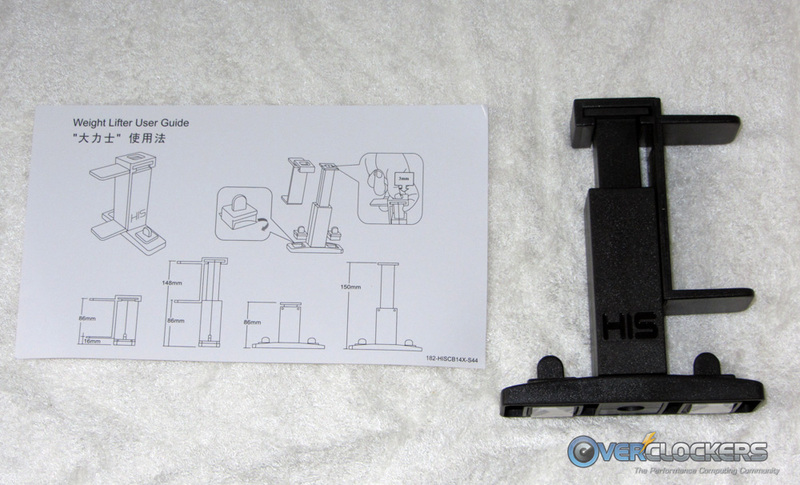 Here is the mystery item in the box of accessories; the documentation calls it a “Weight Lifter” — its purpose is to take some of the pressure from the heavy card off of slot and motherboard. To date, a heavy video card has yet to pose a problem for me, but as the cards get larger and heavier, it is plausible to envision a scenario where the extra heft becomes an issue. The “Weight Lifter” was not used during testing, but for a 24/7 setup, I would recommend utilizing it. Better safe than sorry! Finally, the moment has arrived to take a closer look at the GPU itself. Again, it looks quite similar to the reference card we looked at a few weeks back. 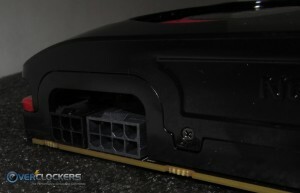 It appears as though HIS has placed the sticker on the card upside down; this should not have any affect on performance! 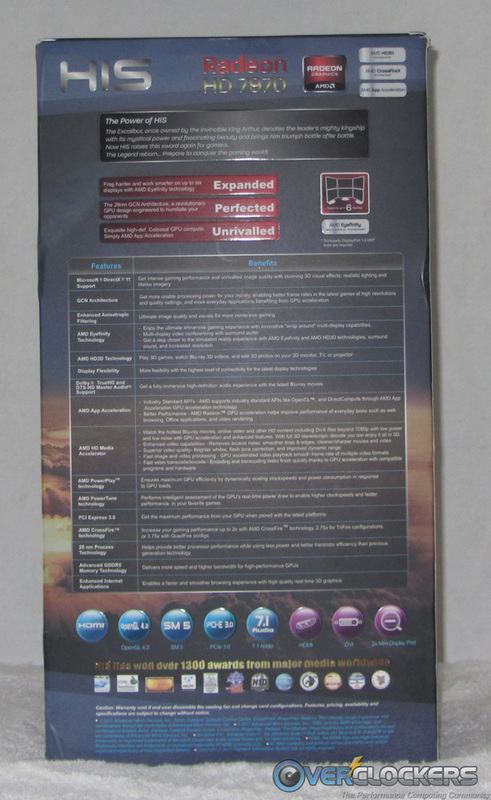 The back of the card is exposed to the elements, in sharp contrast to the previous generation. 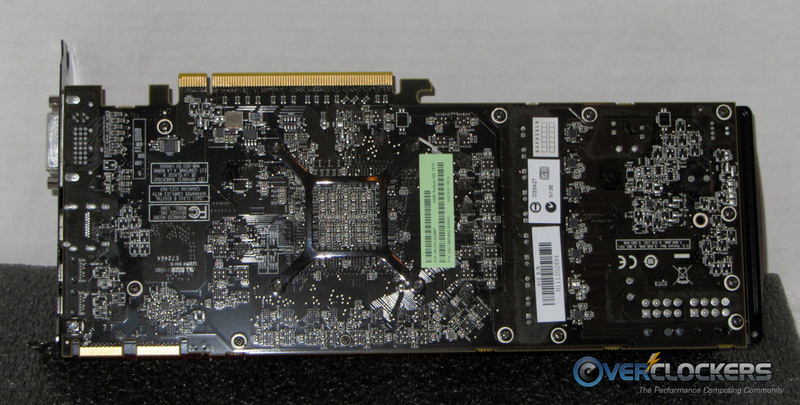 Speaking of which, a quick side by side comparison shows that both the 6950 and 7970 are similar dimensions. Again, the only major difference appears to be the exposed PCB on the back of the card, not to mention the unseen differences like a super-charged new architecture. 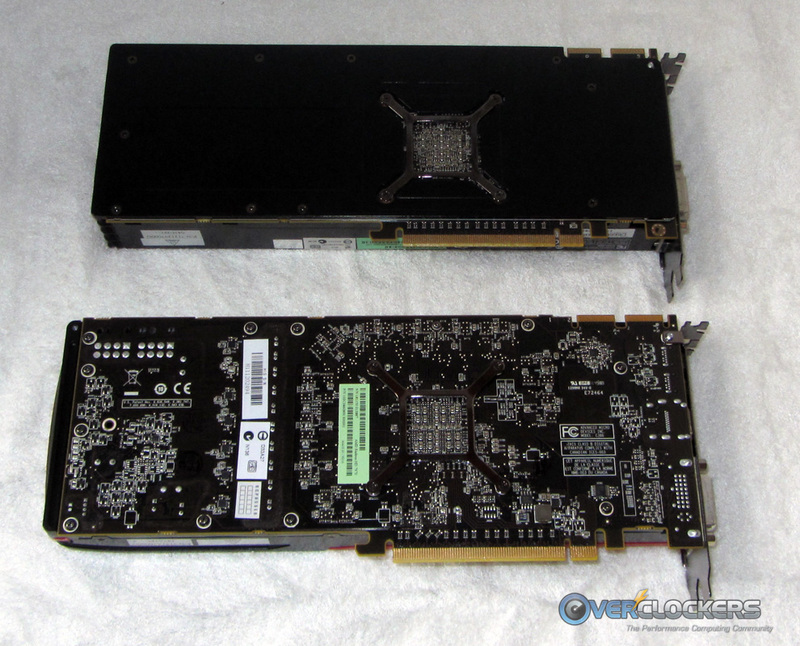 Turning back to the HIS HD 7970, let’s examine it a bit more closely. 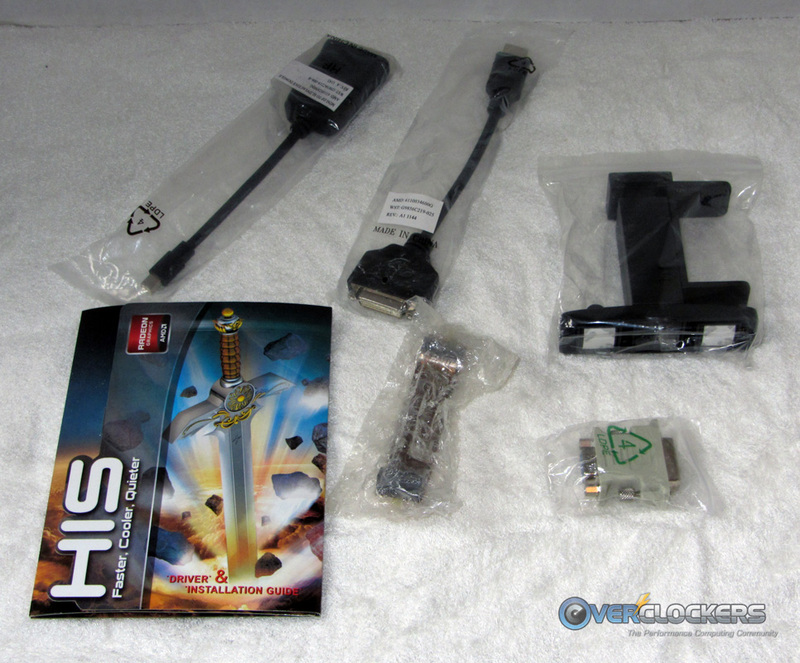 The HIS HD 7970 features a 6- and 8-pin power connector, so make sure your PSU can handle the extra draw, which is only about 35w higher than the 6970 at both idle and full load (as hokie pointed out in his review). As we will see in the performance section, the extra power draw is definitely worth it. The dual BIOS switch is a fantastic feature that takes the fear out of flashing a new BIOS or using Radeon BIOS Editor to enhance an overclock. This was also available in the 6900 series and as such has already been talked about to death. One last look at the card before it hits the test bench, as the outputs have yet to be explored. 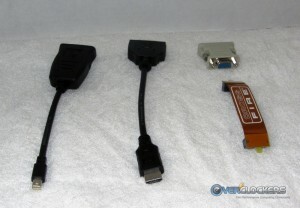 Two mini-DP ports, an HDMI and a DVI output line the bottom of the card in the above photo. 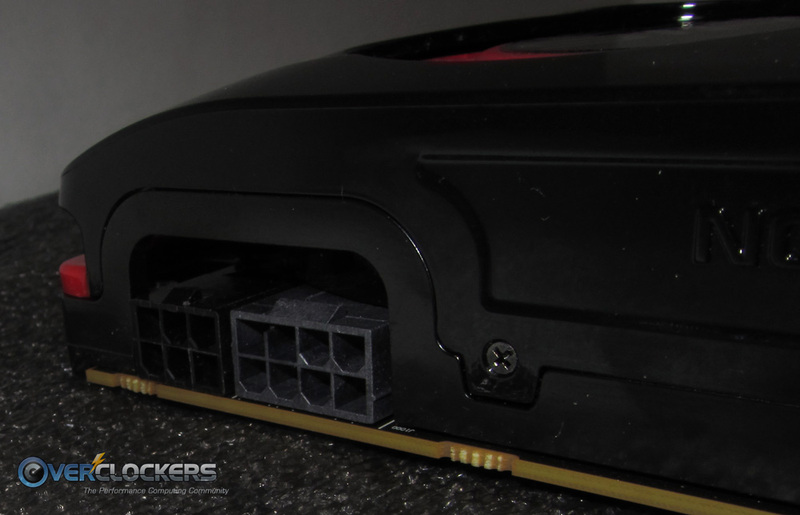 Directly above those is a finned exhaust for the card’s dual slot cooling system. If pricing dictates performance (though we know that is not always the case), then the HIS HD 7970 should crush the GTX 570 and the now previous generation HD 6970. 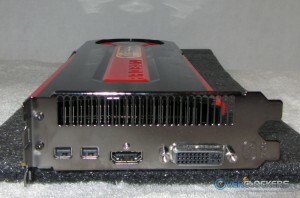 The main competitor for the 7970 is the GTX 580. If this card can outperform a GTX 580 while maintaining a similar price point, then we have clear-cut winner on our hands. 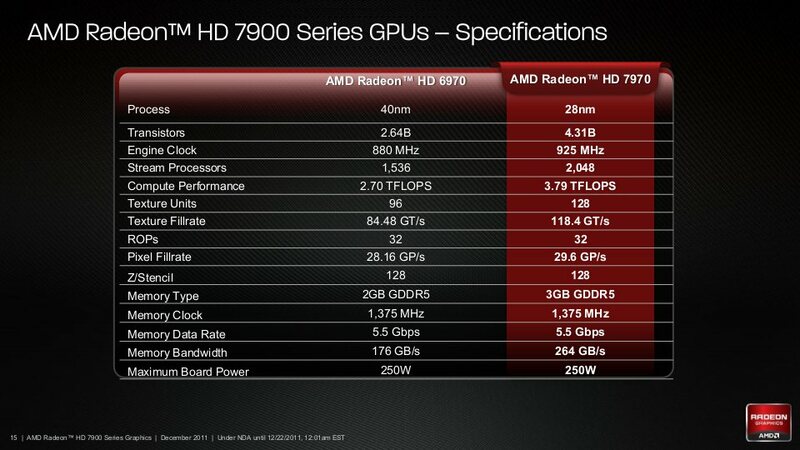 It will be also pretty interesting to see how the HIS HD 7970 compares to the rare, but powerful, HD 6990. If it can even come close performance-wise, the 7970 will provide a great value for the gamer who has no budget (although he/she probably does not care about the price). A launch date nestled between Christmas and CES is a little curious for a game-changer card like this. 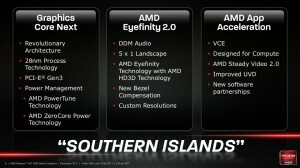 AMD was unable to capitalize on the holiday shopping season or the incredible hype surrounding CES. Also puzzling is the fact that the AMD 7970 was launched two weeks prior to partner 7970s, making it nearly impossible for users to purchase the product after reading the initial review. Many of my purchase decisions are based on reviews, so it seems like AMD missed out on a major opportunity to sell a significant portion of the cards at inflated, launch date prices. 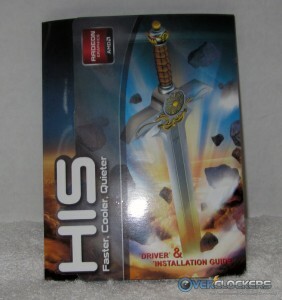 All benchmarks and game tests on the HIS HD 7970 were run once. Any outliers were thrown out and tests were run over again to verify accuracy. 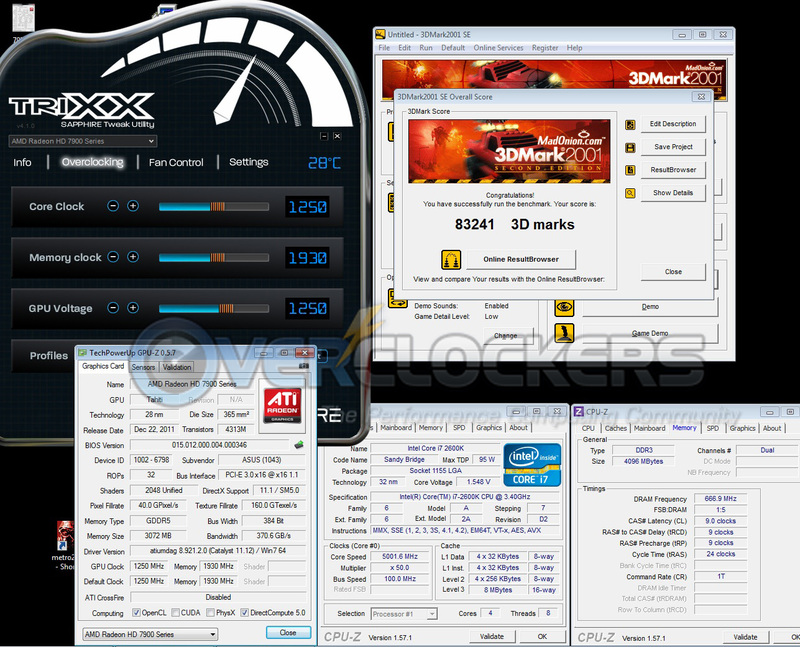 Out of the box overclocking is a breeze using Catalyst Control Center (CCC). The process began with bumping the PowerTune control to “+20%” on the Overdrive tab. 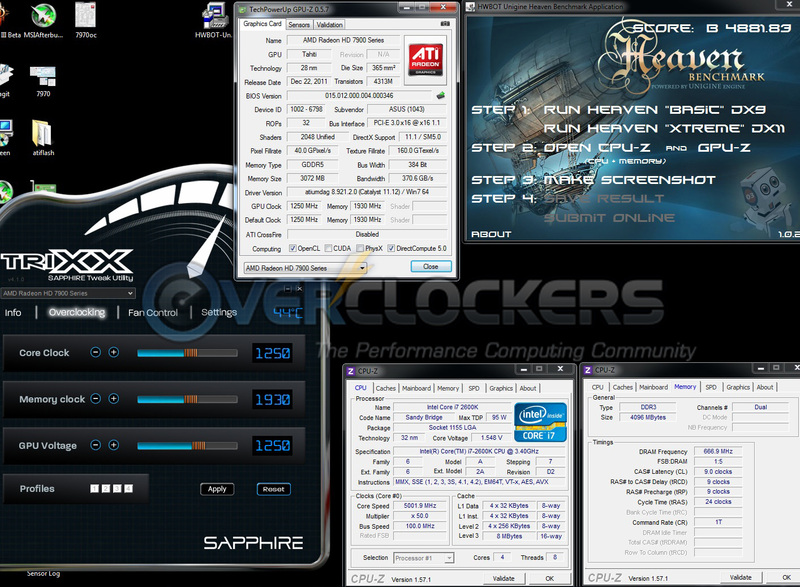 CCC limits overclocking to 1125/1575, as we found out in hokie’s initial review of the HD 7970. While a solid 200 MHz on both core and memory is nothing to sneeze at, there is plenty of headroom to go further. At first, no software was available to push past the CCC limits, but after waiting patiently and digging around, some utilities showed up on various message boards. 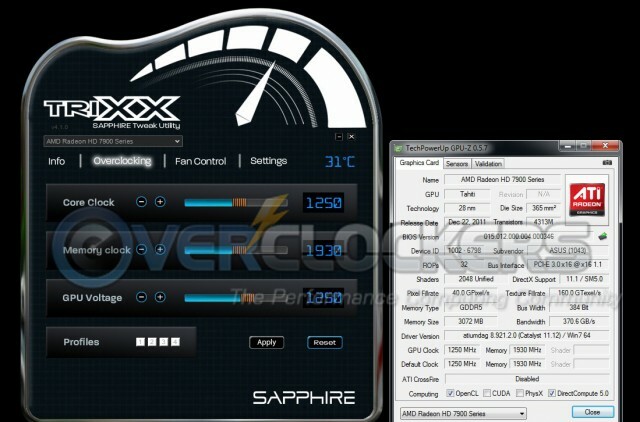 Several options are now available for extended overclocking, including MSI Afterburner 22 Beta 10, ASUS GPU Tweak Beta and a beta version of Sapphire TRIXX. These should be floating around on the internet, though will not be officially available or supported until today (as the product launches). To give a true “out of the box” experience, no voltage increases were made to coax the clock speed any further. 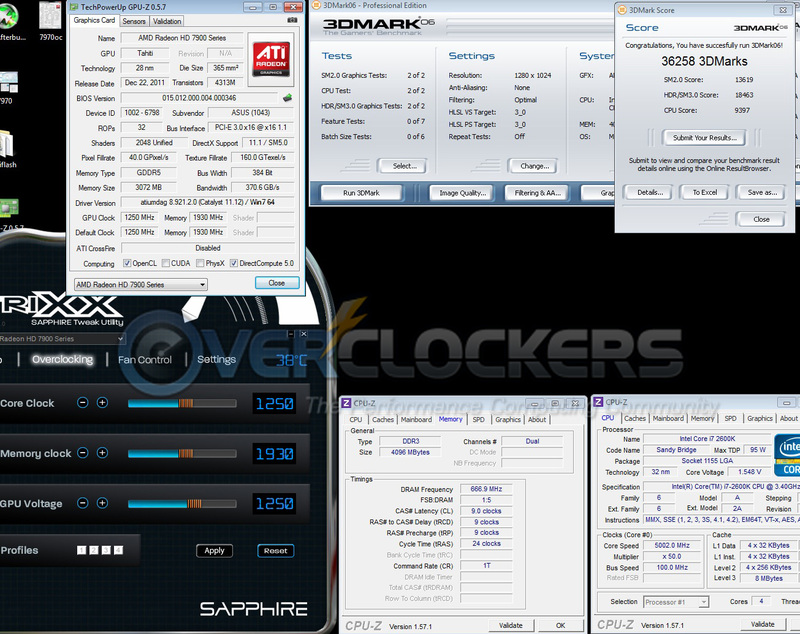 That being said, I was able to reach an impressive 1140 MHz core speed and a whopping 1930 MHz memory clock. That is a 23% core increase and a monster 40% bump in memory. More overclocking adventures will be shared in Pushing the Limits below, but for now let’s get to the performance. These are the most fun for me since all of the 3DMark benches (and Heaven) spit out a score that users can compare against their friends or the HWBot database. For the most part, 3DMark offers a pretty solid analysis of the performance of a video card from many gameplay functions, including tessellation, rendering, shadows, etc. 3DMark03 is pretty outdated at this point and trends towards CPU/system performance instead of direct GPU performance. For that reason, I do not put too much stock in the results, but as always they are least worth a quick look especially since the test setups are so similar. An impressive start to say the least. 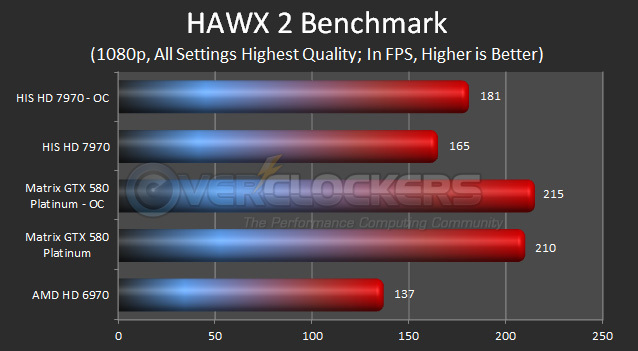 Not only does the 7970 crush the 6970s by nearly 20%, it performs about 7% better than the GTX 580. 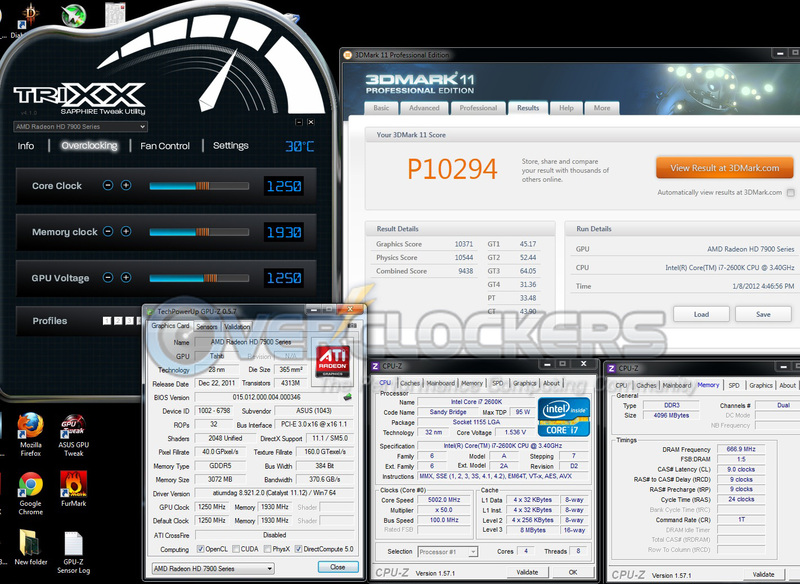 While overclocked, the 7970 goes punch for punch with the pricier HD 6990. Next up is 3DMark06, though it is newer, it actually more CPU-dependent than the 2003 version above. The scoring differences between cards here is even tighter than above, which again speaks to this benchmark’s dependency on CPU/system performance. 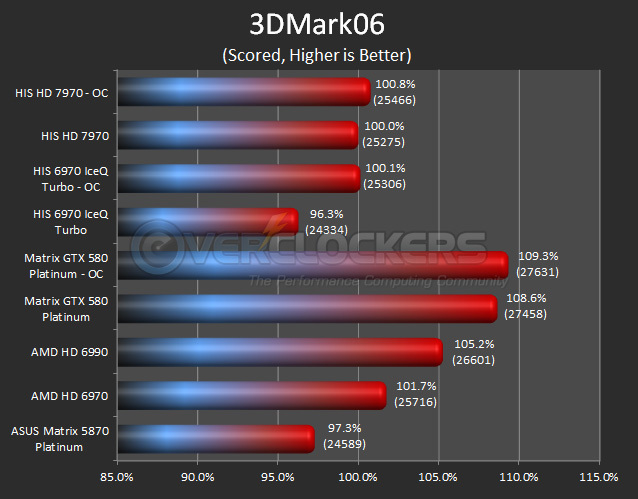 All the scores are within 13% of one another, with the 7970 about on par with the 6970s and falling just short of the 6990 and the GTX 580. 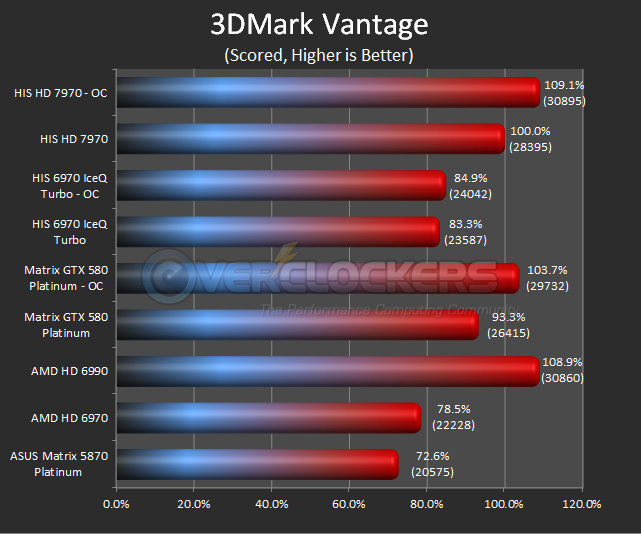 In this benchmark, the HIS HD 7970 beats out both previous generation 6970s by about 20%. 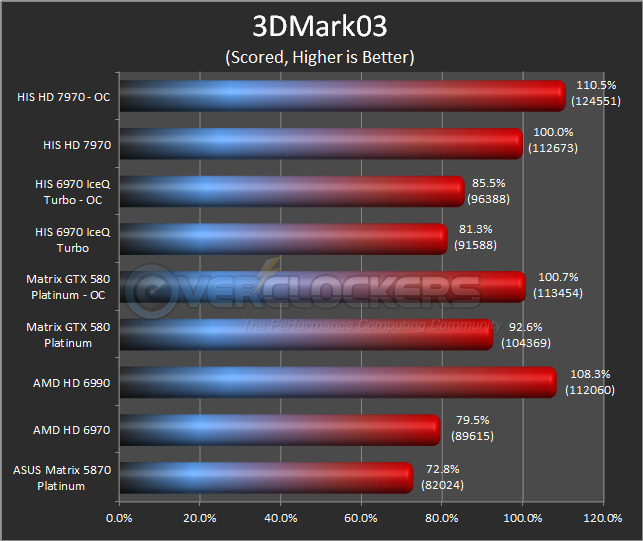 The most impressive result is that the 7970 outperforms the more expensive GTX 580 by about 7%. The heavily overclocked 7970 even inches out the HD 6990, but just barely. Still, quite a surprise considering the $150 difference in price. 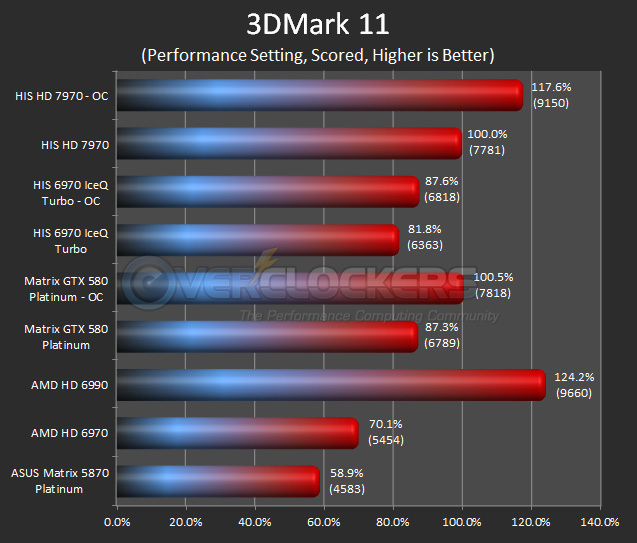 In this benchmark, the HIS HD 7970 really shows its strength outperforming the GTX 580 by nearly 13% at stock and about 17% at maximum overclocks. 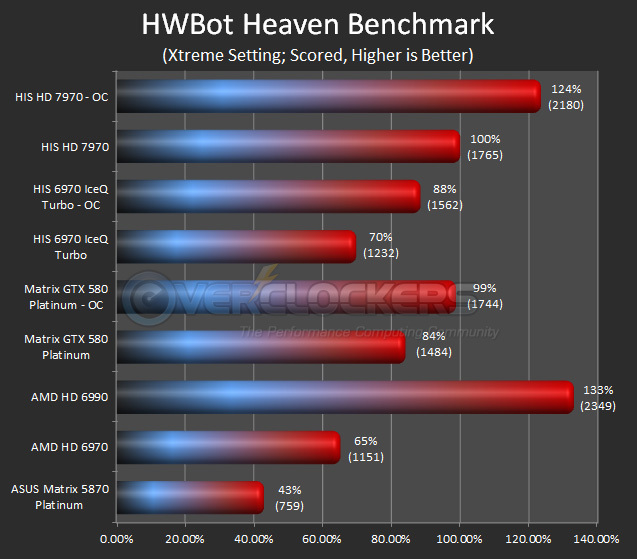 Moving away from the Futuremark brand for a moment, it’s time to check out how the HIS HD 7970 fares against the competition in the HWBot Heaven benchmark. 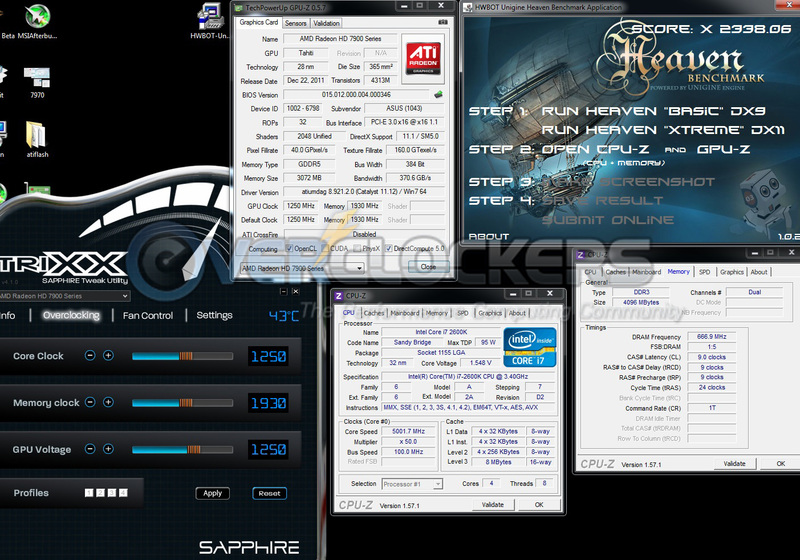 In this test, the 7970 really shows off by outperforming the GTX 580 by 16% and the HIS HD 6970 IceQ by a staggering 30%. The 6990 still manages to squeak past the overclocked 7970 retaining it’s place atop the GPU leaderboard. 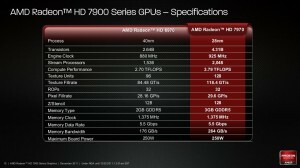 Although it’s pretty clear already that AMD has a new single-GPU champion in the 7970. Synthetics are great especially because of the competition aspect, but there is no way to get a feel for a GPU’s performance quite like throwing it right into the fire of the latest games on the market. 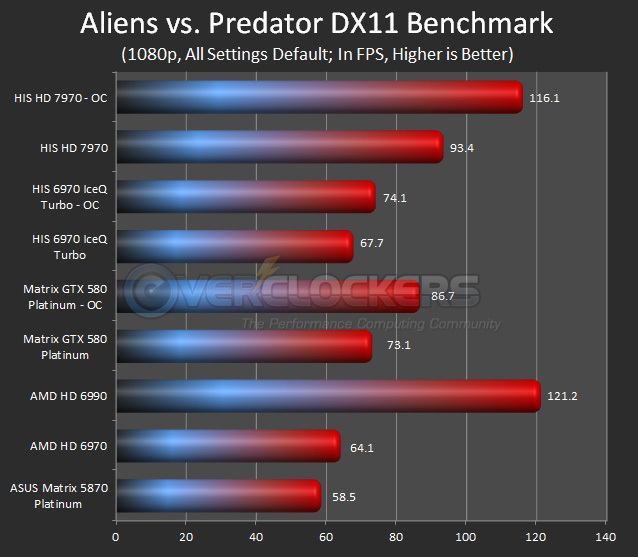 Maybe the GTX 580 has not given up on vying for the single GPU crown just yet? 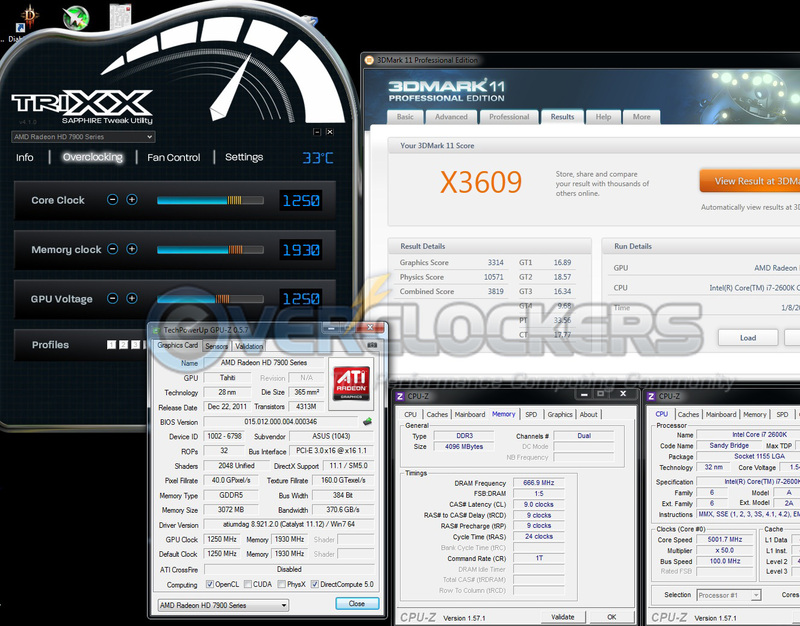 It crushes the HIS HD 7970 in this test, both at overclocked and stock speeds. On a positive note, the 7970 does defeat the 6970. Once again, the 7970 falls short in this somewhat dated game test. 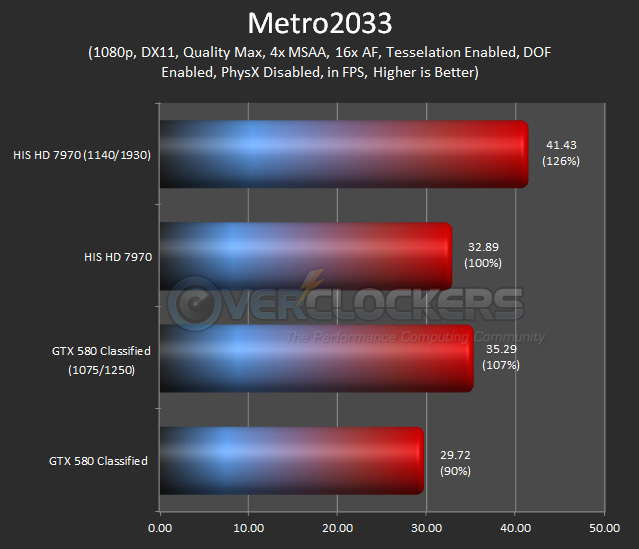 It does come much closer to the performance of the GTX 580, only about 9% difference at stock speed, and even does not fall too far short of the 6990. Once again, the 6970 looks way past its prime, falling about 20% behind the 7970. As the battery of tests continue, the tests become more and more challenging with the introduction of complex instructions like MSAA and tessellation with Stalker: Call of Pripyat. 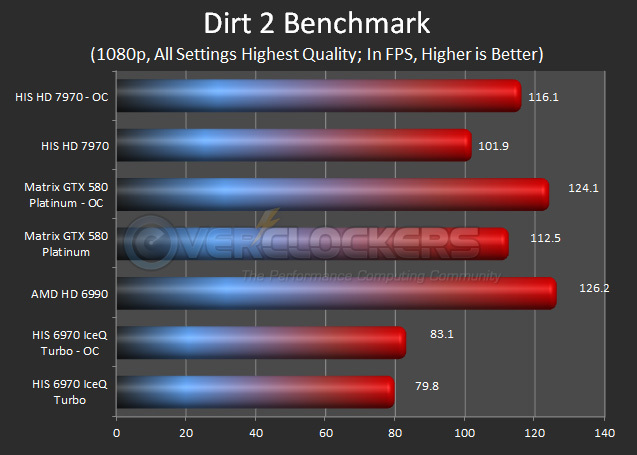 In this more recent gaming benchmark, the HIS HD 7970 shows an impressive 23% performance gain over the GTX 580 at stock speeds and nearly equals the HD 6990. 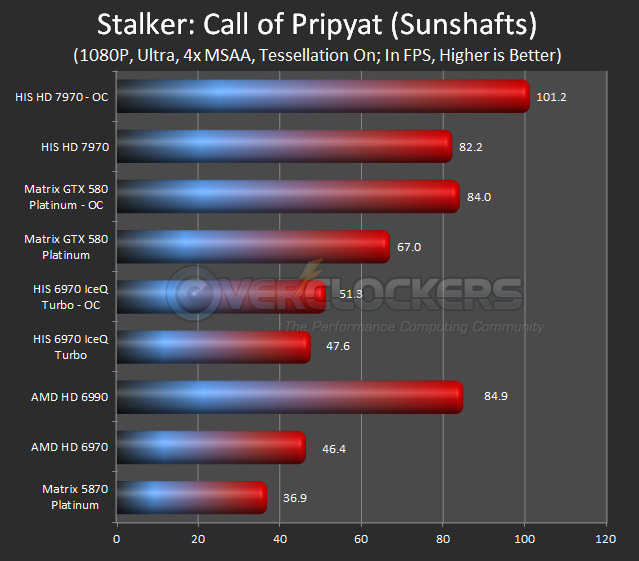 The other GPUs being tested just do not come close to the power of the 7970 in Stalker. 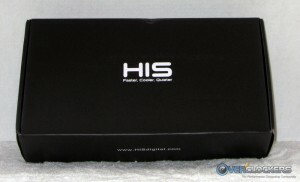 Yet again, the HIS HD 7970 comes out a winner when compared to it’s main competition, the GTX 580. This time it’s about 30% faster than the 580. 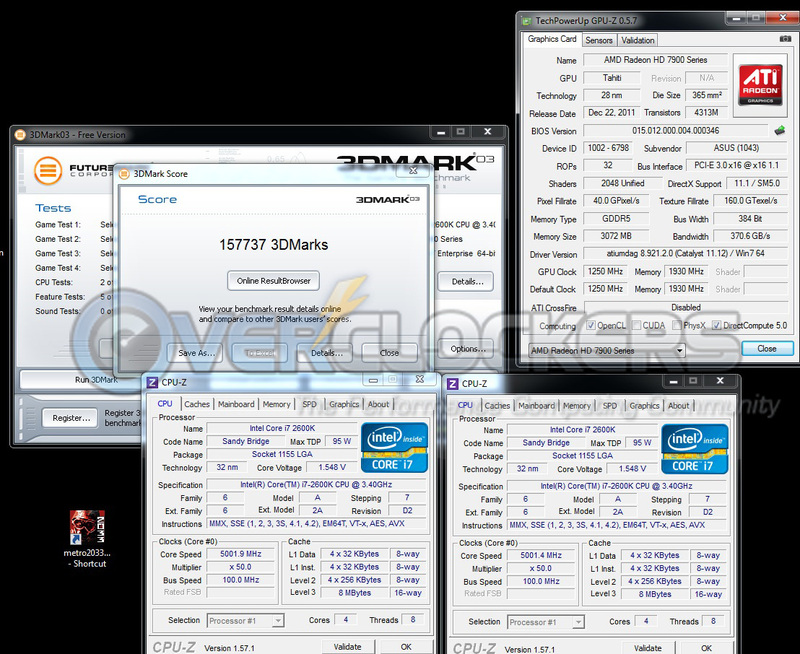 The overclocked HD 7970 almost matches the 6990 in this test as well. Another impressive show of strength by Southern Islands. 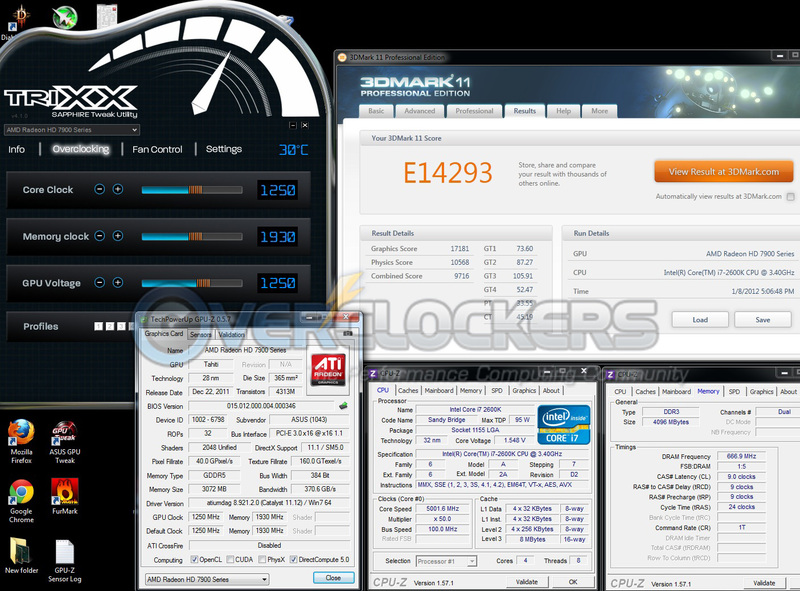 Now on to a benchmark that we have yet to use at Overclockers.com, but has become very popular among our contemporaries. Metro2033 is a DX11, 1080p test that really stresses the GPU, especially with details pushed to the max and tessellation enabled. This game once again has the HIS HD 7970 on top by 10% over the GTX 580. Once the card is overclocked, we see an even greater distance between the two cards, nearly 20% in fact. The HD 7970 did not eclipse the GTX 580 Classified in every single test, but it came close, especially when it came to newer benchmarks and games. With the GTX 580 (at it’s cheapest) at the same price as the HD 7970, it’s now a pretty tough sell for NVIDIA. Not to mention that the GTX 580 Classified used in this review is priced quite a bit higher than the lower-end GTX 580s in the market. 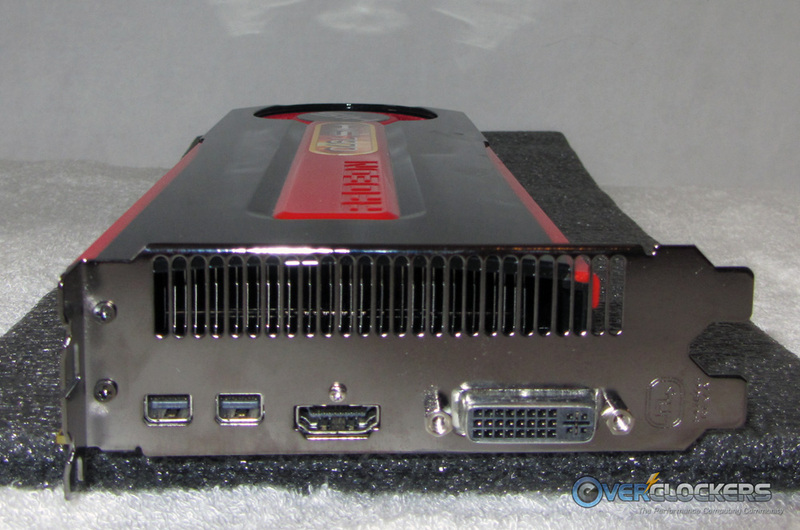 All things considered, it appears that is time we anoint the HD 7970 as the single GPU king! 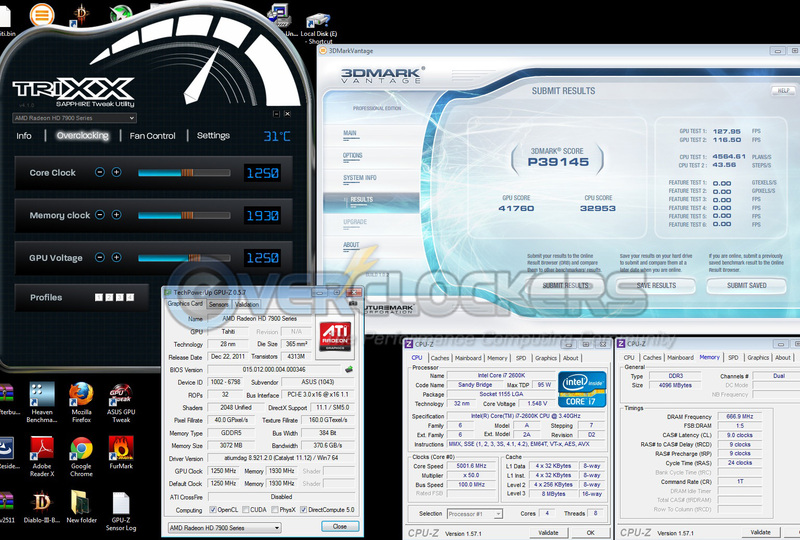 The HIS HD 7970 pushes out some solid performance at stock CPU speeds and stock GPU voltage, but this is Overclockers.com and I know for sure that plan to put a powerful setup behind this GPU. After reaching the limits of this GPU at stock voltage, I was able to flash a beta BIOS from AMD that unlocks voltage control on the HIS HD 7970. Once equipped with the ability to increase the core voltage to 1.3v, I got to work pushing this card as far as it could go. I managed an additional 110 MHz to bring the core up to a blazing 1250 MHz at 1.25v. This was the absolute bleeding edge of stability, any additional voltage or speed led to tons of artifacts during benchmarking. While overclocking the HIS HD 7970, I did run into some issues pinpointing the precise voltage and core speed to achieve stability. Usually the process is really straightforward: increase the GPU clock until it freezes or artifacts appear in benchmarks; then raise voltage, rinse and repeat. Inconsistencies based on different voltages and speeds did arise, which is why I eventually settled on 1250MHz at 1.25v. Any higher than 1.25v seemed to render the GPU completely unstable, despite temperatures that were well within reason. The HD 7970 is a complete game-changer. It blows almost every other card on the market completely out of the water. With a price about $150 lower than the HD 6990 and the same as the GTX 580, the HIS HD 7970 is definitely worth consideration if you want a bleeding edge gaming system. The $549 MSRP is pretty hefty, but this card truly is the single GPU king. It’s performance in both games and synthetics is hard to match. 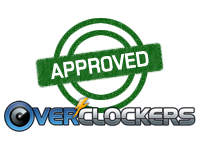 Usually there are pros and cons to consider when assigning an Overclockers.com rating, but in this case the performance absolutely speaks for itself. I can definitely say this card is Overclockers.com Approved without any hesitation. The HD 7970 truly changes the landscape of the entire GPU marketplace and will make the months leading up to NVIDIA’s Kepler release quite interesting. Awesome review! I wanna grab one of these when they come out. I currently have no graphics card and everything looks like garbage on my 27 inch monitor but I can't help but wanna wait for Kepler to see how it all pans out. Thanks, but this one was mdcomp's. Mine was the initial review on AMD's reference card. This is our first partner card review, which he did a great job with! These things are killer clockers krag. If you've got some scratch, buy one and sell those 6970s just to play with it. It was a pleasant surprise to see Newegg listing several models at MSRP of $550 for sure. Great job on the review Matt! What a monster card...! I'll be getting one once the manufacturers release ones with their own coolers. Great reviews from the team here. I'm impressed with the card and the authors. The XFX cooler looks pretty awesome actually. Was reading that this morning. It is already overclocked out of the box, so should be able to get a bit past some of the reference cards assuming the cooler is as good as they say it is. Honestly, the stock cooler wasn't terrible, I ran out of MHz headroom before I got to a point where I felt the card was too hot. After a few weeks hopefully there will be software that allows the cards to go past 1.3v, if that's the case, then a better cooler may definitely be a good purchase. Also, thanks everyone for the kind words! If it was 550 it'd be a no brainer here.. 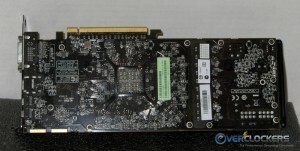 Replace my GTX 580, resell it on ebay before it got too cheap :P. (hopefully get 400+ off it). Then 150 bucks difference. I'd be willing to spend that lol. The XFX Black Edition looks sweet too! ><. Sigh. It's stupid because our Dollar is still higher than yours too >.>. Though I'd probably only OC it as far as CCC allows. I probably wouldn't bother with voltage changes til later down the track. (2560x1440 res btw. Single monitor only). Would be perfect. With XFX already having one out, I can't imagine it wouldn't be a few more weeks before more come out! Do you know if the Accelero Xtreme Plus II fits this beast? Nice review. I can't wait to get one...someday. lol. Is the fan just as loud as on a 6970 w/reference cooler? My XFX 6970 gets pretty loud when fan is turned up high. I'd really like to water cool it/cpu, although it wouldn't be worth it on my 6970...if I was going to water cool my GPU i'd want it to be a 7970. What is that weight lifter all about, isnt it enough when you screw in the bolts? It should be fixed at that point. And how big is the PCB compared to a 6950? The 6950 was like 27 cm when i remember right. ivy its the same size . i havent used screws two Xigmatek clips hold it in fine . On my SFF i have screws in order to stabilize the card, once its inside, so its pretty much immovable. So thats why i wonder whats the weight lifter actually used for because makes not so much sense to me, unless you do not use any screws. But it also depends if the card is mounted horizontally or vertically. When mounted vertically and when screws used, i truly see no use for a weight lifter, its pretty much foolproof. 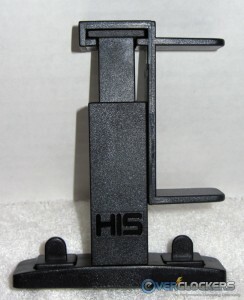 The slot can easely handle the weight in term its pushing right into the ground. But it can become a issue when it is pushing sidewards and not toward the boards horizon. Just so you know what i mean because some got issue to understand stuff. here like this m8 . The end part of the PCB will slightly lower over a period of time, it's just psychics. It's not hard to see. Grab a small level and you'll see what I mean. The instructions of the HIS weight lifter basically states it's just basically a small stud device to further hold your graphics card when moving your PC as a whole. It'll be very handy though once I put a chunk of metal on it. My watercooled 9800GX2...I put a small PVC pipe to hold it up and get rid of it's slant lol.